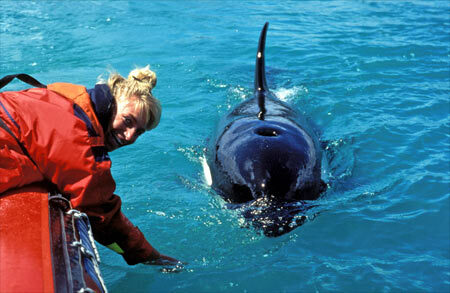 The first New Zealander to research orcas exclusively, Ingrid Visser began her study for a PhD in 1992. However, it was two months before she actually saw one of the impressive sea mammals. Since then she has spotted some individuals dozens of times, taking thousands of photographs. Named the ‘Princess of Whales’ by a women’s magazine, she acknowledges the fierce nature of orcas but regards them fondly. Visser, who is based at Tutukākā in Northland, takes every opportunity to view the animals. When a message comes through to the Orca Research Trust, which she set up, she ties her inflatable boat to her car and heads off to follow up the sighting. Some orcas have become attached to her, especially after traumatic events such as strandings. The orca shown here, named Miracle, was stranded and then rescued in 1993. Ever since, Miracle has approached Visser’s boat to be petted.